Southern California has been a hotbed for the craft beer movement, and Anaheim definitely has its fair share of great spots to conduct your own tasting around town. If you’re in Center City Anaheim, here are your best spots for not only the best craft beers, but great options for food pairings as well. 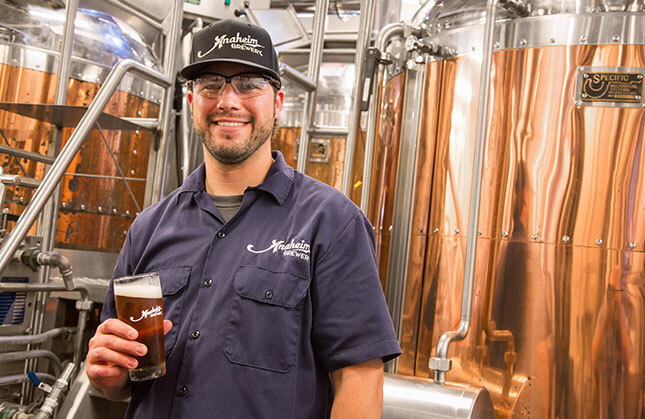 The Anaheim Brewery is the reinvented, reincarnation of the original brewery that was founded downtown in the 1800s. Their current home is in the renovated 1920s Packard Building overlooking Farmers Park. To honor their roots, they’ve named their flagship brew the Anaheim 1888. It’s copper-colored, full-flavored and well-hopped, and is available by the glass, in six-packs or in growlers. Excellent with grilled beef and burgers on the barbecue. They make a wide variety of styles of beer including a Kolsch, a blonde ale, an oatmeal stout, an IPA and a very hoppy double IPA, but they might be best known for their excellent Hefeweizen. The tasting room doesn’t serve food, but they’ll sometimes have food trucks out back and a lot of people bring food over from the Packing House to enjoy on their dog-friendly patio. Southern California brewing scene with his Midwestern roots. Amber brewed with locally roasted coffees. Right next door you’ll find Umami Burger. With six taps and a dozen bottled options you’ll find something to quench that thirst, but the real draw is the amazing food and some of their burger combos actually come with a beer. They offer an excellent draft line-up on a rotating basis and today featured Yeti Imperial Stout, Ommegang Rare Vos and Victory’s Golden Monkey Belgian-Style Tripel. Back over in the Packing House, check out The Iron Press for some impressive waffles and outstanding brews. They have a big selection from some of the best craft brewers in the country and feature a nice array from the best local breweries (check out taphunter.com for their current offerings). They often have beers from the popular Bottle Logic Brewing in Anaheim like the intensely hoppy Elevation Change. Another local favorite is the Good Beer Company’s Saison Ana. And from down south they’ll feature beers from Modern Times and Saint Archer (this day they had the harder to find Saint Archer Blackberry Gose). And you’ve got to try the buttermilk fried chicken served on a jalapeño cheddar waffle. If you’re into multi-tasking, you might also be interested in the Barbeer Shop on the Center Street Promenade. This old school barbershop serves beer with your haircut and you can even get an old-fashioned razor shave. Not a huge selection of beers but they do offer select craft beers on draft often featuring local favorites such as Valiant, Left Coast and Blue Point.